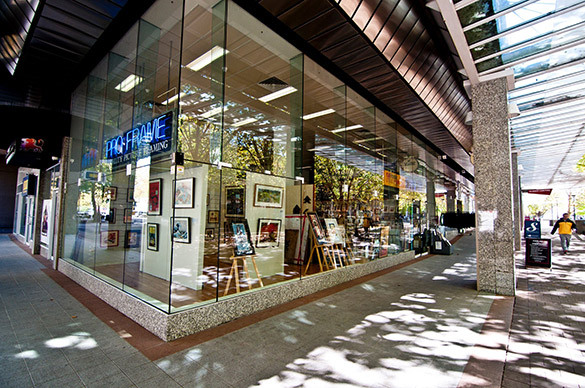 In addition to providing a showcase of the framing talent of the Proframe staff, the Civic Proframe Gallery offers an exciting diverse range of posters, prints, limited editions prints and silkscreens, as well as original artworks. Highlights of the gallery include strictly limited edition, hand signed and numbered prints by Dutch Tattoo artist and designer Angelique Houtkamp and the highly sought after limited edition seriagraphs from Californian artists 'Shag' (Josh Agle) and Kevin Dart. A small range of japanese style artworks are generally available, ranging from commercial prints and reproductions, to genuine authentic woodblock prints. Also popular is our collection of mounted and framed posters which include TinTin, Dr Who and Vintage/Retro advertising art. Beautifully framed prints covering a diverse range of styles, and original photography from local artists can also be found, but if you see something you like, act quickly as we can not guarantee any specific items can be resourced once sold! Significant arrivals to the gallery floor are also documented at our facebook page.